Friends of the Honolulu Museum of Art were saddened to hear of last year’s passing of avid museum supporter Patricia Stanley Lang. Remembered for having a keen and elegant sense of style and sharp wit, Lang was a staple in the local arts community. She grew up in what she called the Golden Age of Hawai‘i. “Being a local girl, however, she also loved the island life and cherished her memories and photos of going to class barefoot at Hanahaouli and Punahou Schools, frolicking on the beach, and seeking mischief and adventures like sneaking in to swim in Doris Duke’s pool with her classmates and lifelong friends,” Noreen Mulliken said. In 1941, World War II caused Lang to move to the mainland with her mother via the vessel, the Lurline. Her father stayed behind to assist with business and the war. Lang first moved to Boulder, Colorado then to Palo Alto, California, where she graduated from Castallea High School. She attended Scripps College and moved to New York to study interior design. Back in Hawai‘i, Lang worked for Alice Spaulding Bowen’s shop at the Royal Hawaiian Hotel. She also married Howard Lang, former Hollywood director turned businessman. The two built a home in Kahala, and Lang tapped into her design skills to beautifully decorate it with art and a stunning garden plan. “She was an integral part of the social fabric of the islands and held lavish parties where she delighted in entertaining friends,” Mulliken continued. 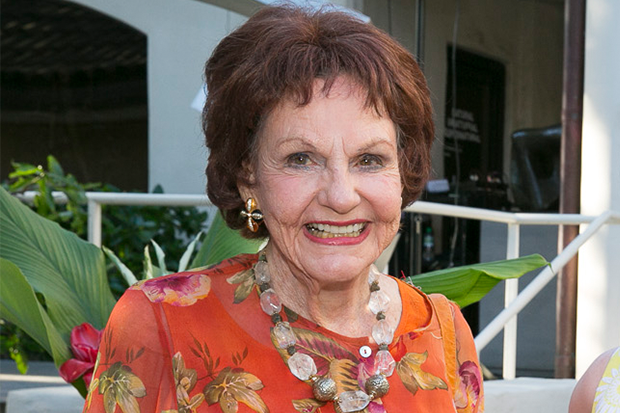 After the passing of her husband, Lang sold the home and moved to a retirement community in Carlsbad, California. Missing the islands too much, she moved back to a home in Diamond Head. As a lover of the arts and orchids, it was only natural that she was a devoted member of the Garden Club of Honolulu, the Garden Clubs of America and the Diamond Head Theatre. She was also a sustaining member and generous benefactor for HoMA, leaving a generous gift to the museum in her estate plans. “Pat was an astute investor, had strong opinions—as one of her friends remarked, ‘She possessed the gift of certainty!’—and leaves her beloved Honolulu Museum of Art a lasting legacy,” Mulliken said. Editor’s note: This post is adapted from the obituary that appeared in the Star Advertiser. Pat Lang really was a “keiki o ka`aina. I never heard of her until now. I would love to hear more of our kama`aina. But don’t wait till they are gone.